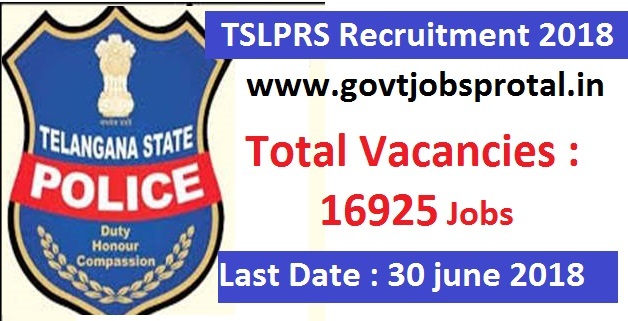 Telangana Govt jobs in Police department for 16,900+ constable posts. Latest Government jobs for 10th pass candidates who are wishing to sever the nation under Police department. Telangana Govt issued a notification in which they said that there are 16,925 total vacancies of constable posts which are going to filling up through this Government job recruitment process 2018. Candidates who are wishing to apply for these Telangana Govt jobs can apply online up to 30th June 2018. After that online application will be disabled by Police department. We advise you to follow the official website of Police department to apply for these 10th pass Government jobs in India. More information about these Telangana Govt jobs under Police department is given below in this post. Read the whole post carefully before applying for these Government jobs in India. Rs.49870/- for all these Posts. What Eligibility Criteria required for applying these Government jobs? 12th Pass/ Intermediate or its equivalent is eligible to apply these Govt jobs. 10th Pass candidates are eligible to apply for these Government jobs in India. What Application Fee to be paid for these Government jobs? Different cast categories candidates have to pay the different application fee for applying these Telangana Govt jobs. In the table we explain the different application fee for different category. How to Apply for these Telangana Govt jobs? Those who have passed in their 10th and 12th class examination can apply for these Government jobs through ONLINE process only. There is no other way for applying these Government jobs in India. We also share the link below for applying online. Check IMPORTANT LINK Section for more reference links. Those who cleared all these Rounds of selection will be placed for the respective Job profile.